Welcome to the October 2014 Mystery Chocolate Box! Autumn is in the air, leaves are on the ground, and chocolate is on your table. Unless, of course, you’ve already finished your bars (we don’t blame you). As always, we’ve had a lot of fun putting this box together for you. This month, we’ve focused on non-mainstream brands — you likely won’t find any of these bars in a local store! Ready to see the bars? What did you think of this bar? We liked it because it’s a tasty dark chocolate bar without an overwhelming flavor, although the blueberries and acai do add a great taste to it. Based in Brugge (Bruges), Belgium, Nirvana Chocolates makes all-natural, organic chocolate bars. They call them “miracles of cocoa” (really). What you taste in their bars is the result of generations of chocolate making secrets passed down by their chocolatiers. The first thing you notice when you open up the wrapper to Bar B is the smell — this bar has quite a delicious, unique smell that is unlike any other chocolate bar we’ve tried (and that’s a lot!). Bar B has a very interesting flavor as well, the taste is a little tangy and fruity. The texture is also nice and smooth for a dark chocolate bar. Some people seemed to get this one right away while others couldn’t quite guess. We thought this bar was delicious — what did you think? Pineapple is definitely a unique ingredient in a chocolate bar so we had to try it out! (and when we liked it, we included it in this box) The only possible thing we can say against this bar is the slight aftertaste, which is a little bitter. It’s still a great tasting bar, though! Kallari is a farmer owned chocolate company in Ecuador and are committed to help preserve the Kichwa culture and community (the indigenous people in Ecuador). Their chocolate making process uses heirloom cacao and natural processes in order to end up with the highest quality output possible. The sweet, creaminess hits you right away as you bite into this bar, and as you chew you notice something crunchy. Definitely milk chocolate. It’s a bright, zesty, citrusy flavor. There is a little confusion with this bar. It’s orange brittle, not almonds, even though some other stores sell this as an “orange with almond bits” bar. We think the confusion comes because the bar itself is in German and says “orange-krokant” or “orange-crocant” which, according to Google Translate, means “orange brittle”. We even extracted a couple of the bits from the bar and tried to examine them, which didn’t reveal a ton, to be honest, although they do taste citrusy even by themselves. We suspect most of the citrusy flavor in the chocolate itself comes from the orange brittle during the manufacturing process. 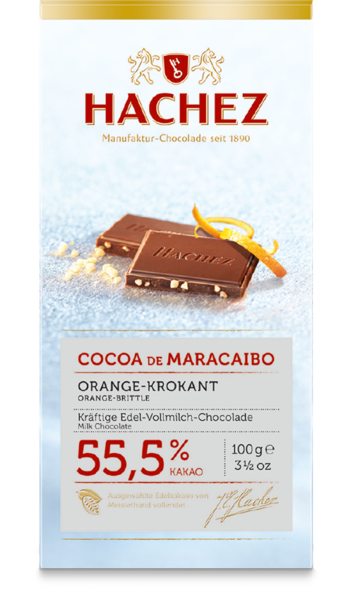 In case you couldn’t tell by the preciseness of the cacao percentage of this bar (55.5%), Hachez is a German chocolate company (sort of, they are owned by a Danish company called Toms now). According to the spiffy Google Translation of their website, Hachez was founded way back in 1890 by a guy called Joseph Emile Hachez. They have a sophisticated chocolate making process that ensures that their bars consist of the highest quality chocolate. That’s about much as we can make out from the translation. Either way, their chocolate tastes amazing. So, what did you think of this box? As always, let us know your thoughts in the comments below. Now, on to November… we’ve got a great box planned! No Replies to "Mystery Chocolate Box October 2014"